Skyfall restaurant is the perfect place for a chilled out date, delicious food, great cocktails and a relaxed atmosphere in a central Hove location, and it was where we spent our Saturday night, and perfect timing for being asked to review a restaurant as it was Sam’s birthday! It was a super cold evening but we were cosy inside, comfy on squishy chairs and seated by the window; perfect for people watching and checking out the slight sleet that was falling, and generally having a wonderful date night! The decor is subtle but impressive, with filament lightbulbs, muted coloured tiled walls and wooden accents. Skyfall (which is on Church Road – a 20 minute walk from central Brighton) has a set menu that changes with the seasons, plus a specials board with a special for each course. There’s plenty of variety to choose from in each course from more elegant dishes to familiar favourites, I think there would be something for everyone, whatever their tastes – including vegetarian options. 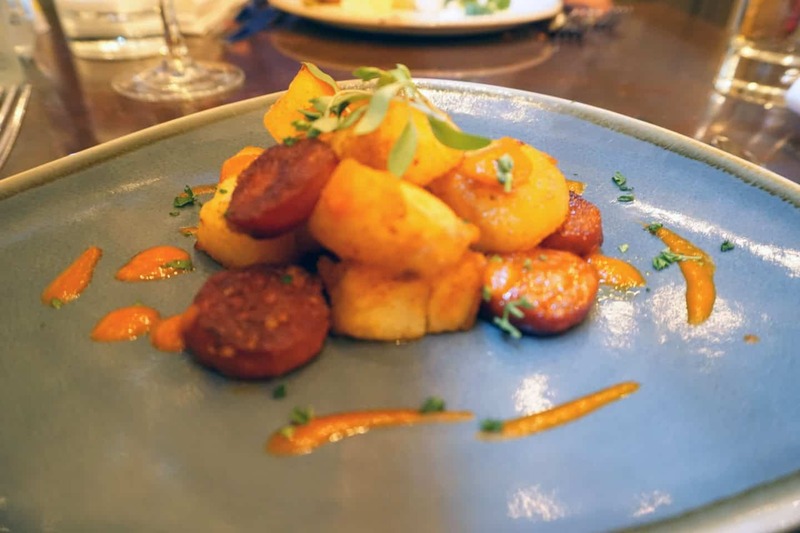 I chose the Patatas Bravas from the specials board for my starter, which arrived with chunks of juicy salami and a spicy jus. 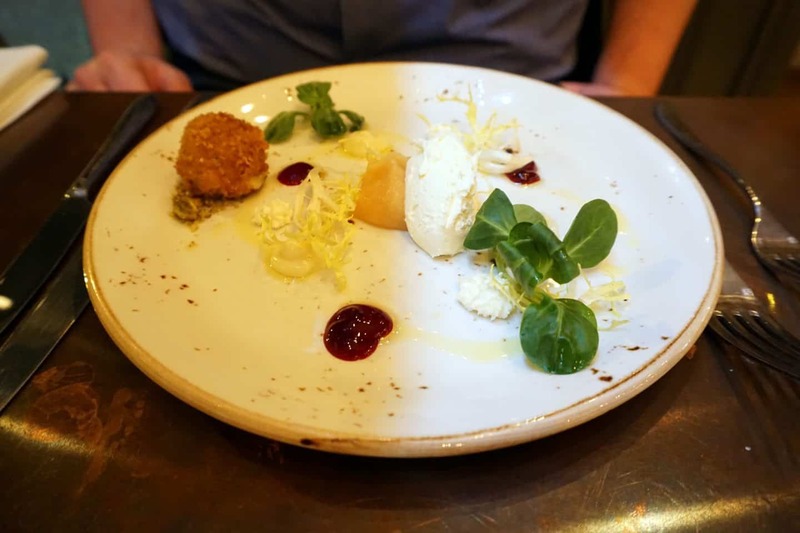 Sam chose the Textures of Cheese; Blue cheese, Goats curd, swiss mornay sauce with port jelly. As a cheese enthusiast it was perfect for him, he said it blew him away! He wouldn’t share either, so definitely a hit. We ordered a couple of cocktails after our starter, a Mojito for me and a French 75 (a gin based cocktail with prosecco) for Sam. Strong but flavourful, my Mojito went down a little too quickly but was a great accompaniment for my main course. As I said the menu choice is quite varied, and because it was a cold miserable winters evening I wanted some comfort food, and found it in the shape of the Southern Fried Chicken burger, which arrived with a heap of chunky chips, coleslaw and a small salad. 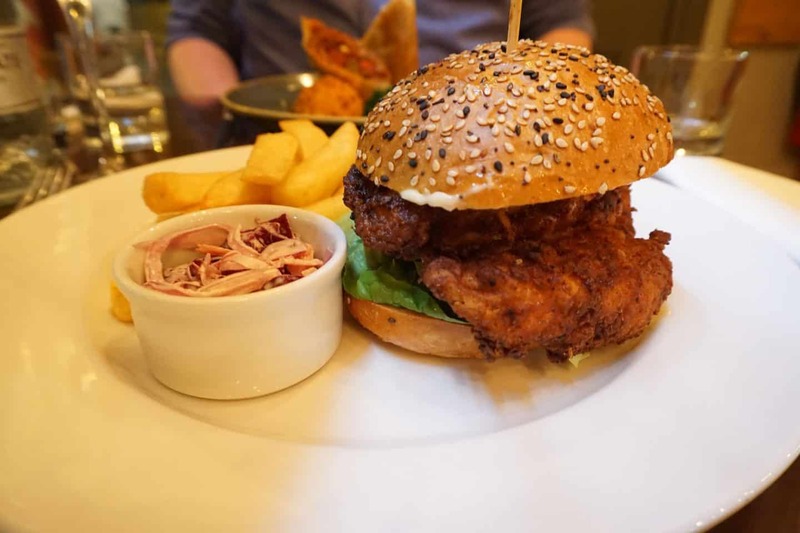 The chicken breast was a generous size and had obviously been hand coated in the slightly spicy southern coating, giving it a great texture, nothing like a traditional ‘southern fried’ burger you’d be imagining. I could eat it twice over I think, if I had the room! 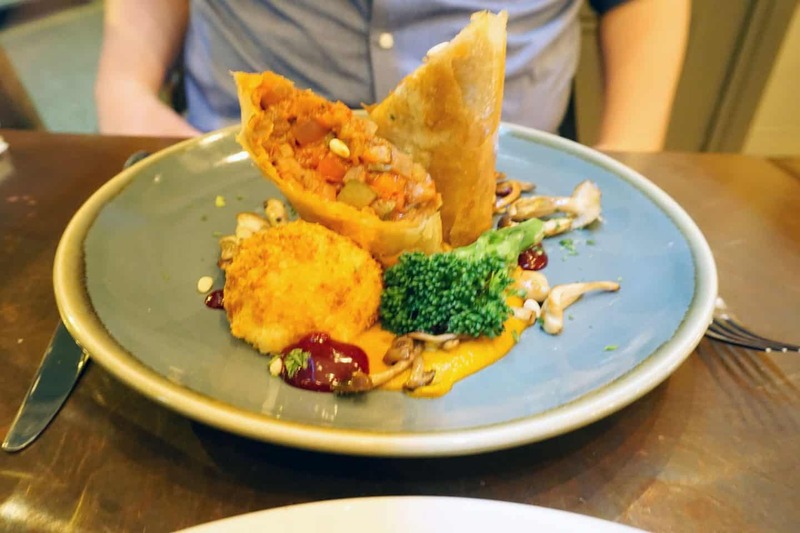 Sam chose the Ratatouille & Arancini, which was presented perfectly and he did let me try this… feta and sundried tomatoes parcelled up with the ratatouille, with crisp arancini on the side, scattered with pine nuts, with mushroom and spiced carrot on the side. It’s the sort of meal you just would never make at home as it’s so intricate and you wouldn’t be able to do it justice anyway! Which by the way my blurry photo does not do either… sorry. 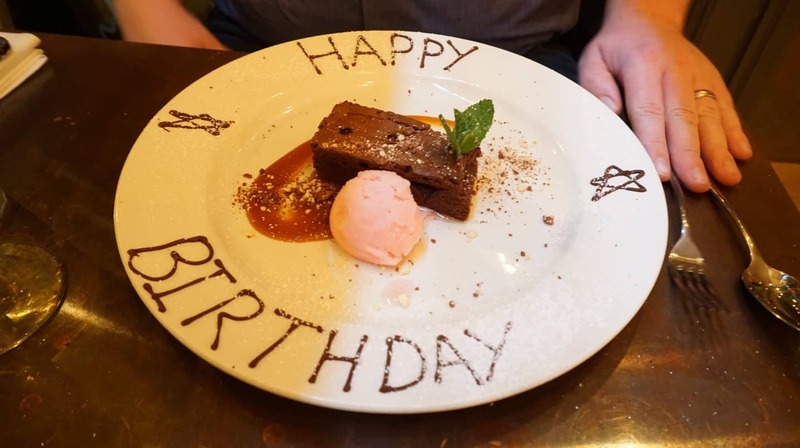 Sam’s Dark Chocolate Brownie arrived with a birthday message, and a rendition of Happy Birthday from two of the team too, plus a few other diners joined in! It was a lovely touch and he got a little red faced with pseudo embarrassment but I think he loved it really! It was just as a Brownie should be, gooey on the inside and crisp round the edges, perfection! The Skyfall chef makes all their ice creams in house, the flavours were amazing and next time we visit I’ll be after a taste of the Basil ice cream! We were planning to head somewhere else for some after dinner drinks but after having another look at the cocktail menu decided to stay put! 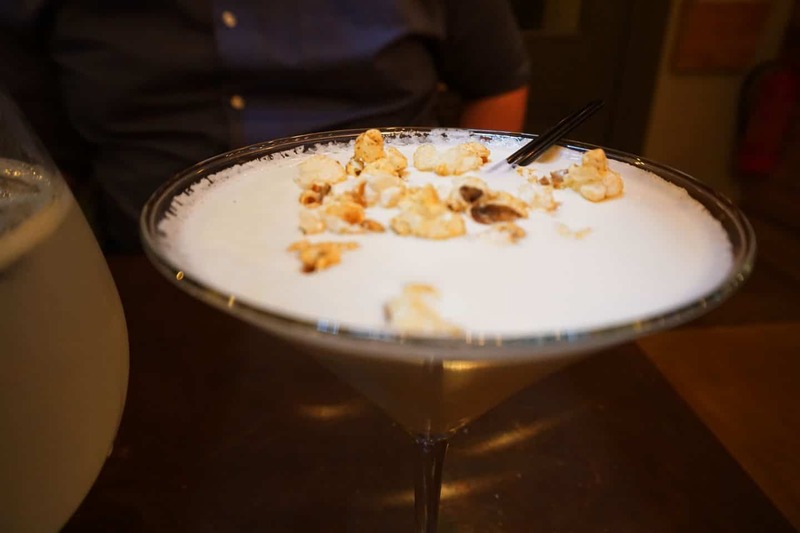 I had a Gin Fizz, a lovely fresh tasting elderflower concoction and Sam had the amazing Popcorn Martini! A butterscotchy, creamy glass of deliciousness, topped with popcorn, naturally! Again they managed to capture that slightly caramelised popcorn taste perfectly. We had a little chat with our waitress and the manager, who explained that they restaurant had had a complete change of team around a year ago. Open Monday to Saturday for the Brunch (9-1) and the main menu then on Sundays they just serve a variety of Roasts. They also do a tasting menu and special fixed prize menus for occasions like Valentines day. The restaurant was almost full when we arrived at 8pm, with another couple arriving after us, who provided lots of entertainment, in a good way! They reminded us of us; pre-kids in the days when we ate out more than we ate in! Though we’d never be so presumptuous as to tell the waitress to tell the chef how a meal could be served differently! We had a lot of fun with them watching a car reverse into another one though, which gave us all a little chuckle (the car was fine, by the way!) Had there not been an entertaining couple though the background music was spot on, acoustic versions of recent releases, very Live Lounge in style and just right. They will also be starting to have some live music from the spring, so we’ll be back to enjoy that! 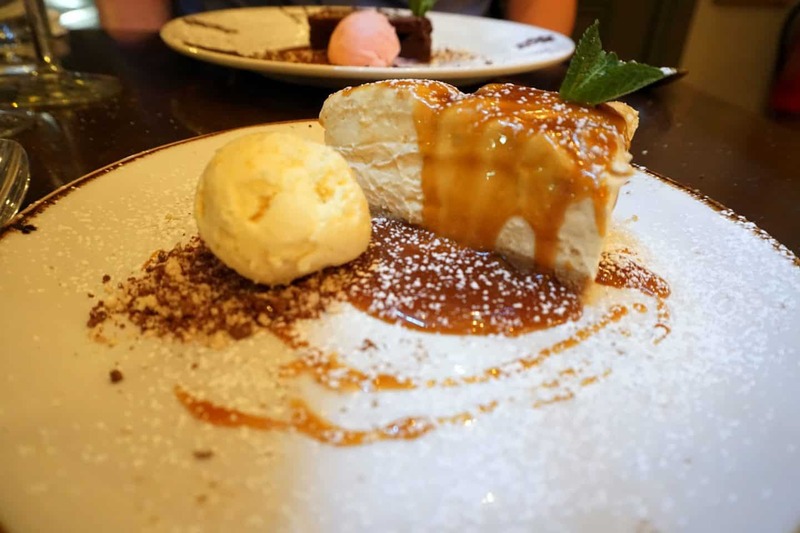 You can book a table by giving them a call on 01273 041007 or book online here (plus view their current menu) and I would advise booking especially at weekends! View more local restaurant reviews on Belle du Brighton. We were invited to enjoy our meal in return for an honest review, our food was complimentary and we bought our own cocktails.